Like most fans, for me the Petra: Farewell DVD would succeed or fail by one simple criteria: could I find my face in the crowd? With that out of the way, let's get down to what most folks really do care about: the content. 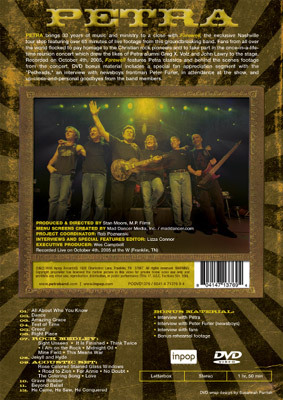 The DVD consists of the concert itself plus some special features, which include an interview with the band, an interview with Peter Furler of Newsboys/Inpop, interviews with fans, and concert rehearsal footage. The concert soundtrack itself is almost exactly the same as what you'll find on the CD. The only major difference I noticed is that Bob's solo is truncated; it lasts only 30 seconds or so on the DVD. All the rest of it — every song, every spoken word, every note — is the same as the CD. But the video portion of the concert adds so much. Now you can see the looks on the band members' faces. You can see Paul Simmons' intensity as he hammers the drums, throws up his drum stick, and catches it one-handed. You can see the artistry as Greg Bailey performs on the cello. You can get the shivers watching Greg X. Volz and John Lawry take the stage to rejoin Petra. You can watch John Schlitt mouth the words to Volz's songs during the "Acoustic Set." The lighting is amazing, the picture is crystal-clear and you can see the band for all they're worth. You get smiles, wrinkles, sweat, energy, everything. The video is edited in a very fast-paced, contemporary style. There are quick camera sweeps, jerky motion, multiple-zoom-in-and-out effects, close ups, and wide shots. The cuts between shots come fast and furious, especially early in the concert (It's like "The Bourne Supremacy"). Some folks may find this distracting, but for me it added a lot of energy to the concert. In most of the wide shots that show the entire stage and part of the crowd, the crowd isn't making much big movement. In fact, it's not until "Beyond Belief" that the entire mass of people really starts to jump up and down. But the camera guys got excellent coverage of individuals jumping in the crowd and pumping fists, people singing along, excited faces, and other stuff that is intercut throughout. The atmosphere of the concert and the editing style mellow a bit from the "Acoutic Set" through the end, which is probably appropriate. There were mercifully few special effects. The two main effects I noticed were a full screen of static (usually lasting only a half second or so) and a black-and-white "old footage" effect. The latter effect is the only thing I could have done without in the concert footage. It was really distracting to me, and they used it a lot during "Jekyll & Hyde" and the "Acoustic Set." In fact, during the "Acoustic Set" they used this effect in order to include footage from rehearsal, which seemed out of place. Without a doubt the most interesting of the special features is the band interview. It's a bit of a misnomer, though, since most of the interview is conducted with only one current band member: John Schlitt. Former members Greg X. Volz and John Lawry join him on a couch. Two bits from Bob Hartman bookend the interview. Obviously John, Greg, and John have lots of anecdotes from throughout Petra's history, including how each got involved with the band. The interview is surprisingly fresh and interesting. It's just too bad they didn't include Greg Bailey or Paul Simmons. The fan interviews are nice. Internet Petra fans will likely recognize many of the faces and names like Michael and Cathy Jones, Sue Dempster, and Eloisa Palacios. Yoli and I were not interviewed because we were checking into our hotel and eating at the time they filmed this part. The Peter Furler interview is decent, but strikes me as a missed opportunity. He has stories to relate about times the Newsboys opened for Petra and about Petra's role in blazing a trail in Christian music. But the feature could have been made more relevant (and interesting) by adding interviews of other Christian music luminaries. For instance, John Styll, the president of the Gospel Music Association was in attendance at the concert and could have been interviewed. The bonus rehearsal footage consists of Hartman, Schlitt, Volz, Simmons and Bailey practicing several songs from the Acoustic Set. It has a lot of light moments and jokes. It's interesting to watch the guys practice, especially Schlitt teaching Volz to sing "No Doubt." There are also several bits of the vocalists having "opera" moments with long sustained notes. Later in the footage, John Lawry joins the group and tries to get his keyboard set up. The feature ends fairly abruptly, but it's a nice, quick behind-the-scenes look at what went into the show. At the concert, Petra performed three songs which were not included on the Farewell CD: Judas' Kiss, C-H-R-I-S-T-I-A-N, and Lord I Lift Your Name on High. Additionally, when Bob Hartman broke a guitar string, Paul Simmons performed an impromptu drum solo which also failed to make the CD. Many fans were fervently hoping this material would be included on the DVD, either as part of the concert or as special features. But it didn't happen. Here's a bit of explanation. "Bob (Hartman) and the band sat together and listened to the full playback and they picked the songs that turned out the best," said Rob Poznanski, general manager of Inpop Records. "We (Inpop) did not pick the songs for them. They had complete control over that part." Hartman elaborates: "It was mutually decided between the band and Jim Cooper which songs would be cut. I was told there was a time limit we needed to be under." He explained the reasons each of the three songs was left off. Judas Kiss: "(It) was on our first live album and we didn't get a good enough take of it to avoid some extra work. Given the very short time we had for any additional fixing, we axed it." C-H-R-I-S-T-I-A-N: "(It) wasn't really a song, just something for fun we threw in." Lord I Lift Your Name on High: "I can't honestly remember but I think it was a time thing." Regarding Paul's drum solo, Poznanski said: "That was really spontaneous, if you remember. ... We did not get a clean run at it." Bob's guitar solo was trimmed down because of "a time issue," Poznanski said. This is basically a no-frills DVD. There are no closed captions or subtitles. The menus are simple, with backgrounds from the same artwork as the CD/DVD cover and music samples from the concert. The special features have some oddities. When you reach the end of any of them, rather than return you to the Special Features menu, another special feature just starts up. Pressing the "Menu" button on the remote during any of the features takes you to the disc's Main menu, not the Special Features menu. Despite a few shortcomings, every Petra fan should get this DVD. Years from now, very few will remember the missing songs. What they will enjoy are the amazing performances, the excellent video, and the emotion of the event. 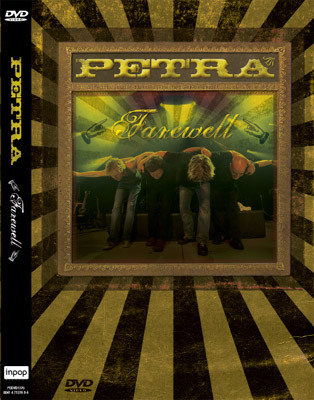 The disc is a very good representation of Petra's Farewell Tour. Throw in the goosebump moments with Lawry and Volz plus the special features, and you've got a DVD that will be treasured by fans around the world. 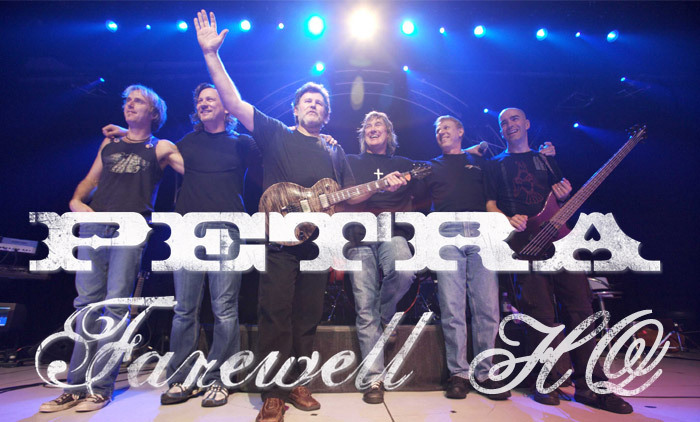 I am grateful Inpop made the Petra: Farewell CD and DVD a reality. This was a risk for them. But I'm glad they took it and gave Petra the send-off they deserved. Now that you've read the review, talk about with fans from around the world on our messageboard! We have links to web stores carrying the DVD on our ordering page.